While on the trip, photos were strictly regulated, and I was only officially allowed to take photos in pre-determined directions in pre-determined spots. However, I made efforts to get as many other photos as I could. This one was taken out the back window of our moving bus. The arch is a brilliant and grand symbol, instantly recognizable from the far corners of town. It also made for a great distance marker the next morning while running the marathon. Part of the marathon route goes through the traffic circle surrounding the arch. 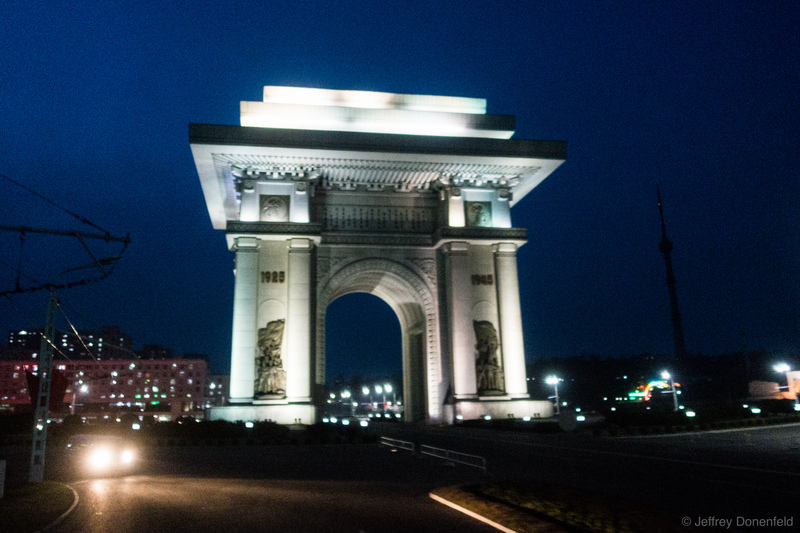 The triumph arch is lit brilliantly at night, however as you'll notice, not a lot else is. There are a few street lights on the main street, but they quickly fade away into darkness. There's very little nighttime illumination in public areas, aside from monuments and billboards. While on the trip, photos were strictly regulated, and I was only officially allowed to take photos in pre-determined directions in pre-determined spots. However, I made efforts to get as many other photos as I could. This one was taken out the back window of our moving bus. The arch is a brilliant and grand symbol, instantly recognizable from the far corners of town. It also made for a great distance marker the next morning while running the marathon. Part of the marathon route goes through the traffic circle surrounding the arch. The triumph arch is lit brilliantly at night, however as you’ll notice, not a lot else is. There are a few street lights on the main street, but they quickly fade away into darkness. There’s very little nighttime illumination in public areas, aside from monuments and billboards.